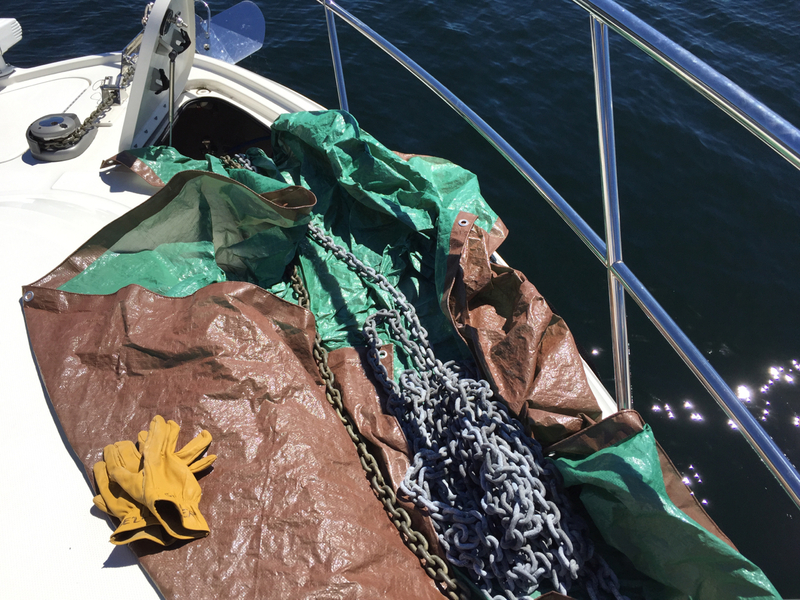 Anchoring is almost always fun and often challenging (we recently had an anchoring adventure in Desolation Sound). 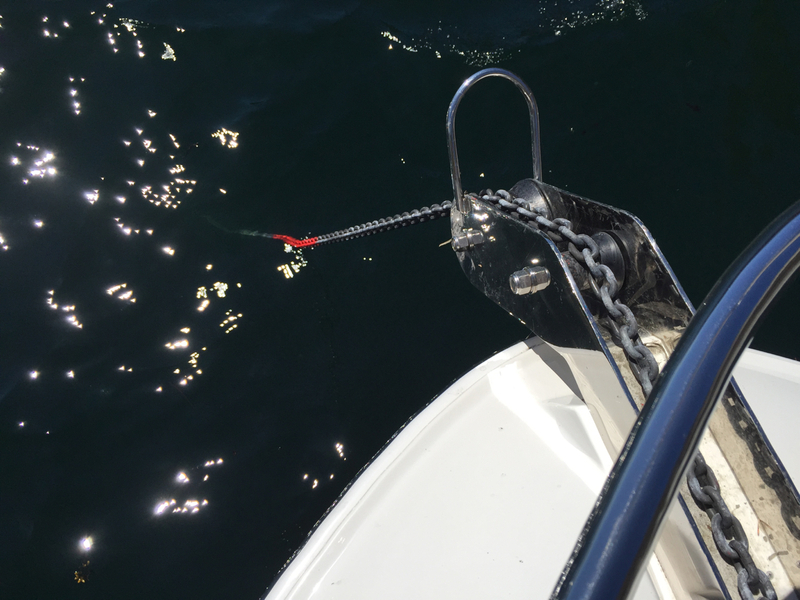 Beside learning key techniques related to placement and holding capabilities, it’s critically important for boaters to understand the ratios (scope) of anchor rode (chain or line) to water depth. There are lots of online resources and videos to guide boaters and teach them some of the best techniques for the various types of anchoring that can be performed. Anchor manufacturers also provide useful resources. A small list of some of these guides will appear at the end of this post. Instead of discussing holding capabilities and scope, this post, instead, will share our experience painting our anchor line. While there are electromechanical chain counting systems, a simpler visual system sometimes works just as well and is certainly more affordable. The first step was to pull out all the chain from the chain locker. 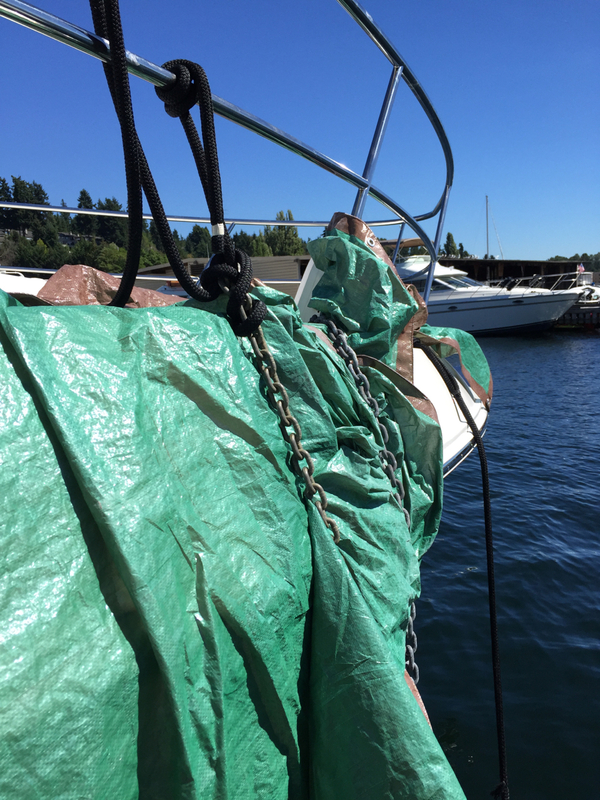 I used two tarps to protect the bow deck and the side of the boat. The weight of the chain would serve to keep both of them in place. I recommend using work glove while handling your chain. As a practice, I wear them whenever dealing with ground tackle and, especially, the windlass. While I was pulling out chain I had someone on the dock, next to the boat, start collecting the chain. A dock line was used to secure the anchor end of the chain, which would remain on the bow. 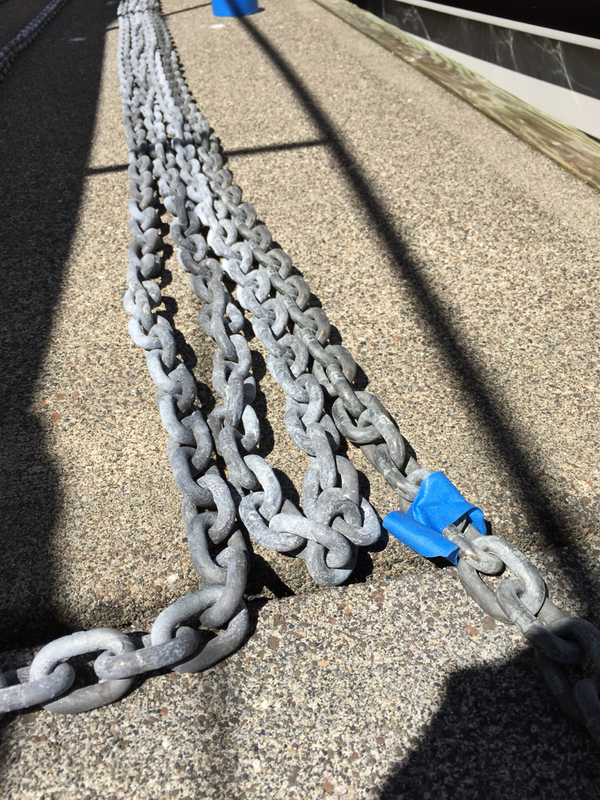 I used a tape measure to determine the first 30 feet of the chain, starting with the anchor swivel connected to the anchor. One we had some chain on the dock some painter’s tape was used to mark the first 30 foot position. You can decide to mark your chain in whatever lengths you feel are appropriate. 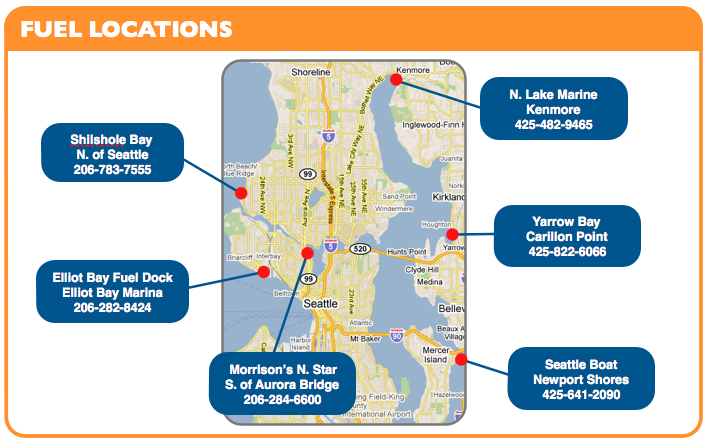 A vast majority of our anchoring is in Cozy Cove near Carillon Point or in Andrews Bay next to Seward Park. For whatever reason, we’re always calculating our scope and chain length in 30 foot sections – so that’s how we measured things out. Our dock has ten foot sections which makes measuring our 30 foot sections super easy. After three dock sections we’d turn our chain, wrap it around and pull back to our starting point. 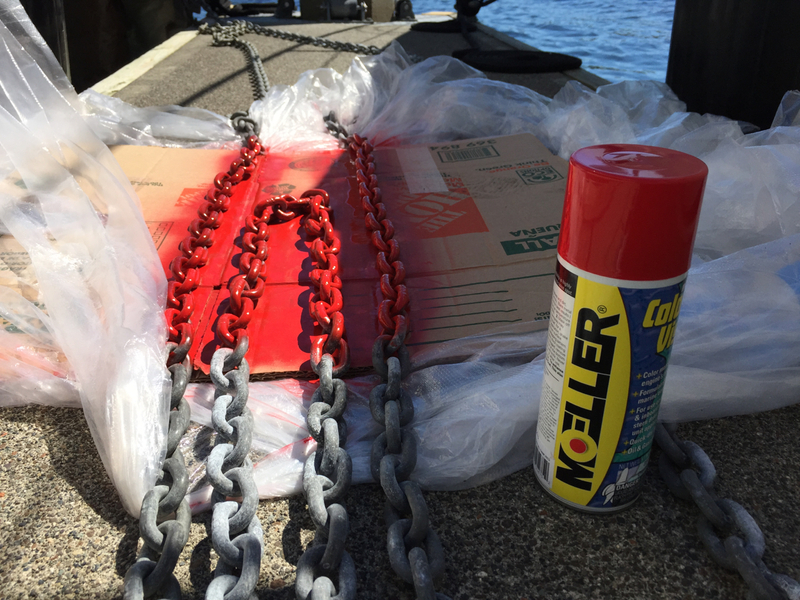 Once our chain was laid out it became a relatively simple matter of protecting the dock and boat and then, simply, applying some marine paint. We selected red because we thought it would be the easiest to see. Almost any paint brand will work. We selected a can of red Moeller spray paint that we purchased at Fisheries Supply. It was designed for marine applications. 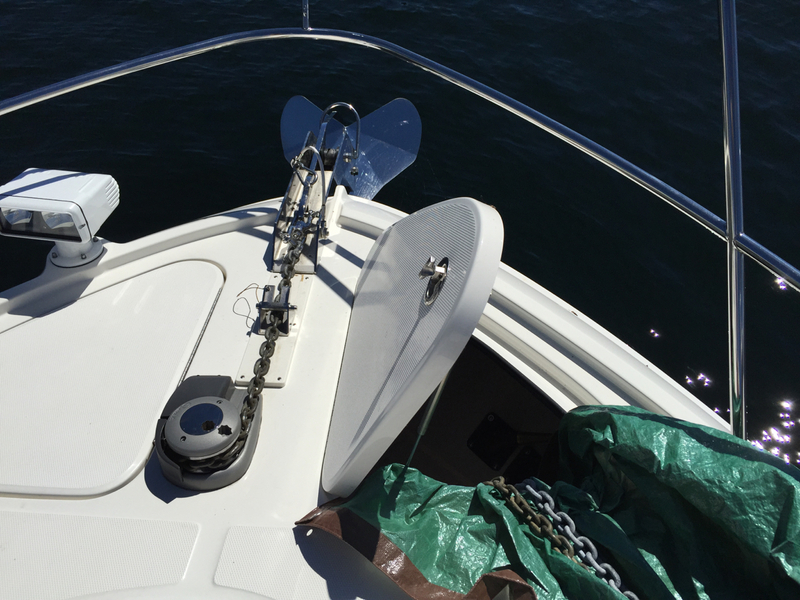 It’s likely that you’ll have to refresh your markings every few years depending upon how often your chain is exposed to the windlass and water. The whole marking job took about 90 minutes, which included time for the paint to dry. We definitely measured multiple times before applying paint. Our marks ended up being at the 30′, 60′ 90′, 120′, 150′ and 180′ positions. For all chain rode in the Pacific NW the scope is typically 3:1 allowing us to, conceivably, anchor in depths up to 60 feet. While some people use different patterns to designate the different length segments, all our markings were the same – big red areas about a foot or so in length designed to be easily seen as anchor chain is let out. We were confident that we could keep track of our six marks instead of trying to decipher some dash-dot or varying color pattern. Did you know that boat manufacturers (from small cruisers to big yachts) continue to sell and deliver their products without installing integrated smoke alarms? Boats with enclosed cabins will typically come with carbon monoxide detectors, but it’s rare for smoke and fire detectors to be present – despite the clear and obvious benefit to health and safety. 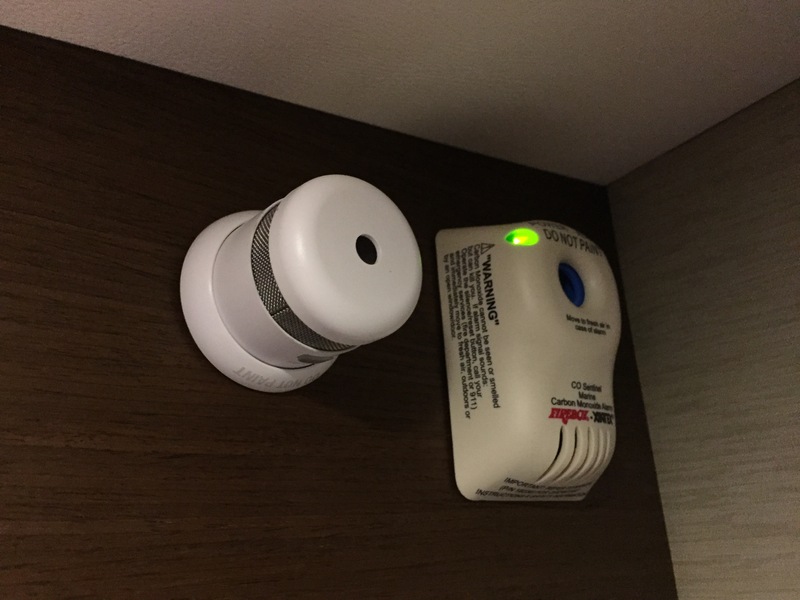 Recently I discovered a smoke and fire detector that seems purpose built for boats. It’s small, battery powered, easy to install and has a piercing audible alarm. Manufactured by First Alert, the SMOKE1000 Atom Micro Photoelectric Smoke Detector has found a place aboard our boat the MV KAYLA. First Alert SMOKE1000 (left) seems ideal for boats. It was installed next to the built-in carbon monoxide detector that the vessel’s manufactured provided. Although I’ve linked to Amazon for the SMOKE1000, I discovered them at Loews for a few dollars less at under $20/each. If you need several there’s also a three-pack available through Amazon. If your boat has an enclosed cabin with sleep quarters and you don’t have a smoke detector it’s imperative you acquire and install one. Don’t wait until it’s too late! 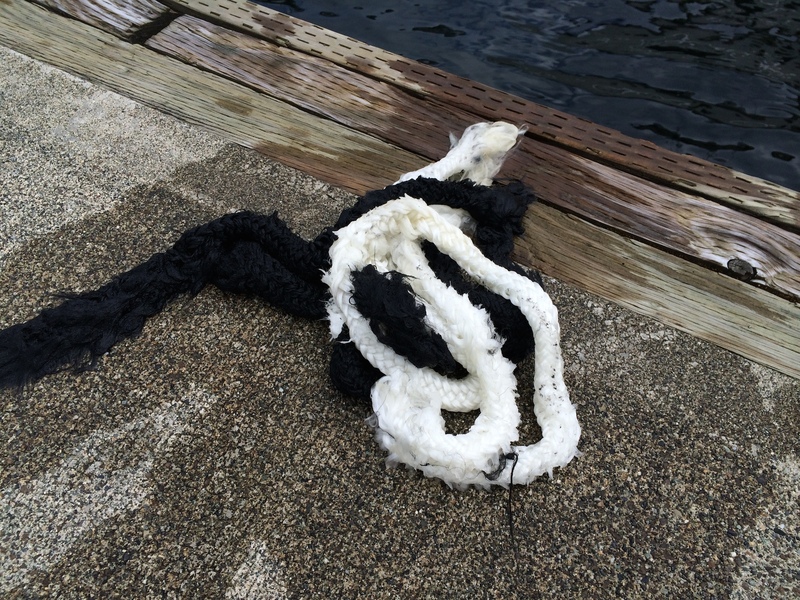 Every boater is likely to one day run aground, foul a prop and hit a dock a little too hard. This week I got to check-off one of those by getting a line wrapped around my port prop / pod after what was, otherwise, an awesome day of swimming in Andrew’s Bay on Lake Washington. For those unfamiliar with the type of line we use on our boat, the white part is supposed to remain inside the black part! So, what happened? Well – long story short – we were out for an extended period of time and, well, nature called for Kayla. For some reason, dogs don’t seem to want to pee in the lake, perhaps worried that it will compromise the quality of swimming for everyone else. Kayla ended up relieving herself on the bench seat in the aft area of the boat. No biggee. Everything is water and puppy pee proof. However, there happened to be a line on the bench, wrapped in a nice coil, that I felt needed to be rinsed off. So, I threw it overboard to clean in the lake. Guess what I forgot to pull up before enabling the engine and pulling up anchor? Yep – that line! Luckily, the engine did not stall. Cathia and I were able to swim under the boat and cut the line, though not completely. Neither of us would make very good pearl divers. So, some of the line remained on the prop – stuck between, and on, the two props on the port drive (yes, there are two counter-rotating props on each drive). It wasn’t possible for us to detangle it better. But, the engines started. 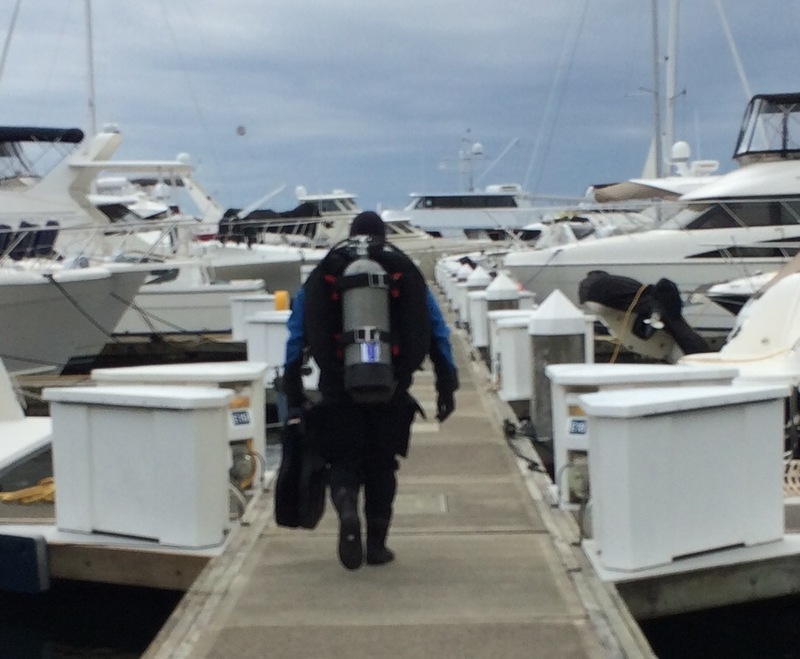 And, we were able to head out toward our marina. At higher RPMs I felt a vibration I didn’t much like. No one else could feel it, but I did. And, I wasn’t willing to risk further damage, no matter how unlikely. We limped back from Seward Park to Kirkland at 7 knots. It was actually quite delightful. The next day I hired a diver to jump down and detangle the line. At $150 for two hours of work I thought it would easily be worth it. Took Chris, the diver, about four minutes! Still, worth it. I couldn’t have done it myself. So, all is good and, hopefully, that’s the last time something like that happens. At least, it’s likely to be the last time it happens because of something stupid I did. 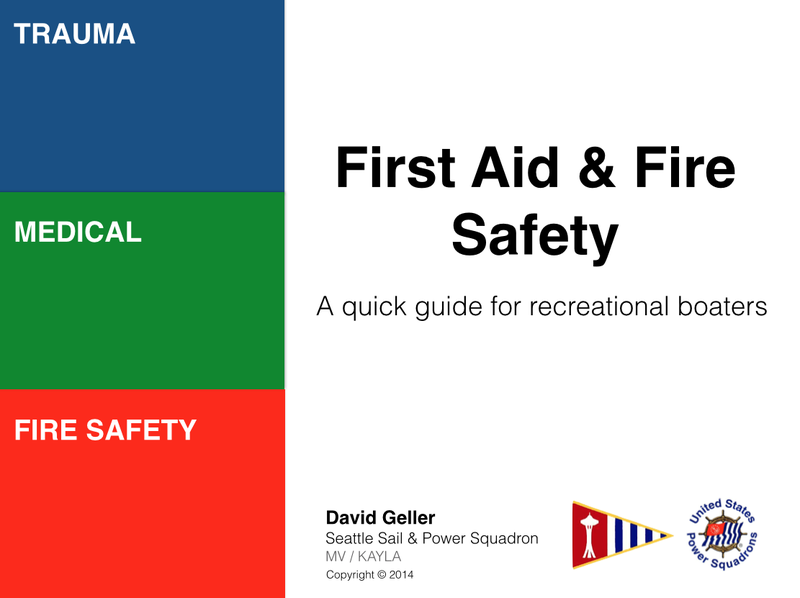 I was recently invited to present a short, 50 minute course at a recent Sea Skills event organized by the Seattle Chapter of the United States Sail & Power Squadron. Drawing upon my interests and background as a volunteer Firefighter and EMT, I produced the presentation linked below. Providing useful emergency assistance while on the water mostly takes common sense and some very basic skills. If you have questions, suggestions, or corrections, please reach out to me. Visit your keel – and stay dry! Here’s a quick tip for satisfying your boating curiosity and, if necessary, shedding light on a problem you may, one day, encounter underway (such has hitting a dead-head with a prop, fouling an anchor line, or worse!). It has to do with observing the underside, or keel, of your boat, and doing so while (1) remaining perfectly dry and (2) not having to haul your boat out to a trailer or dry-dock. This past Seafair Sunday I decided to experiment with a GoPro HERO3 HD camera by attaching it to a utility pole and submersing it at the stern of the MV LAIKA. What I received was a pleasant surprise and, for me, a rare glimpse into observing our two Mercury I/O drives in action. If you’ve watched any extreme sports these past few years (skiing, motocross, base jumping, etc.) or broadcast TV personalities reporting from inside a car, you’ve likely experienced footage from the amazing GoPRO (or similar) camera. This class of small digital cameras are fitted with incredibly wide angle, relatively fast, fixed-focus lenses. They deliver stunning HD quality video. While floating 200 feet above the bottom of Lake Washington, just North of the I90 bridge, I decided to attach my HERO3 camera to a utility pole and submerse it under water. The brief video below demonstrates the clarity and quality of the captured footage. You’ll see our port-side engine, swim deck and one of the trim tabs. The starboard engine can be seen briefly. If you’re familiar with the MV LAIKA you’ll know it’s outfitted with Mercury’s Axius computerized drive system. That’s why the props were occasionally spinning. The GPS-controlled “Skyhook” electronic anchoring system was running and the boat was attempting to keep its position. Note – it’s incredibly dangerous to be anywhere near the engines when this system is running and we would never allow anyone to enter the water while it’s on. Actually, as policy goes aboard our boat – no one gets into the water or near the swim deck when the engines are on and the keys are even physically connected to the console. To date I’ve used GoPro cameras to capture bike riding adventures, skiing and, now, the keel of our boat. They’re fun to use and you’ll find numerous uses for them – some entertaining and some very practical. GoPro cameras start at $199 (you can pick them up online or at Best Buy) and current models use micro SD cards for storage. A 32GB class 10 card runs around $24 and can store hours and hours of 1080p HD footage. My Seamanship instructor and fellow ThreeSheetsNW blogger Bill Ray talked to the class one day about lists and how important and useful they could be to boaters. We had been talking about accidents and catastrophes and how they often begin, not because of one single event, but through a series of small mistakes or mishaps. Lists can be an essential ingredient, if created and used properly, in thwarting accidents and catastrophes. It’s why they’re used and so important, for example, in aviation. The Admiral expressed a desire to refine her boating skills so that she’d feel more comfortable taking the Laika out without me. While I’ve spent countless hours on the boat familiarizing myself with all the systems and taking numerous solo voyages into the lake, there hasn’t been an easy way of transferring that knowledge. So, we decided a set of lists would be useful. There are a bunch of little steps required to be performed every time we take the boat out, or bring it back in. Thus was born the Captain’s Guide for the M/V Laika. 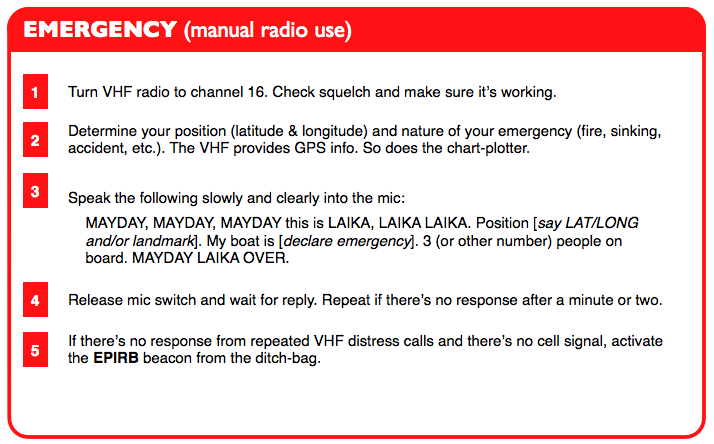 Incidentally, M/V stands for motor vessel. You’ve undoubtedly heard the term SS used. That stands for steam ship. A whole list of these can be found here. I selected a 5×8″ format in landscape orientation. I created the booklet in Apple’s Pages program, but could have easily done the same using Microsoft Word. It was important that the guide be JIS-5 rated, so I went to Fedex (Kinkos) and laminated each of the pages after producing color copies on 32lb bright paper and trimming them down to a reasonable size. I drilled some holes and bound the pages with notebook rings. We’ll be testing the guide out over next few weeks and making changes as necessary. One section I plan to add soon will provide a quick overview of the steps and documentation necessary to travel between the US and Canada using our NEXUS status. Another will contain vital insurance and accident reporting information. If you’d like a copy of the guide you can grab a version I created without all our personal information. There are versions in PDF, Pages and Word formats.